To order – click on WEARANDTEAR PADS above. Andrew Grogono, a Chartered Engineer and life-long sailor, used his engineering experience to design this simple solution to damage to gelcoat surfaces caused by chafe from lines and ropes. 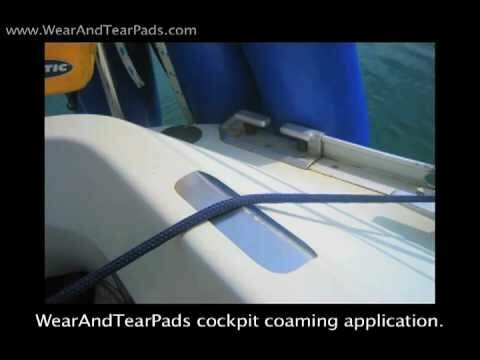 Called ‘WearAndTearPads’, they are comprised of ultra-thin marine-grade stainless steel sheets with a high spec self-adhesive backing. They have been in use on Andrew’s own Beneteau for several years and have been well reviewed in yachting magazines worldwide. Unlike other anti-chafe products made of carbon fibre, Kevlar, PTFE,Pur Clear etc. our stainless steel pads are guaranteed to never wear through. Global sales have been achieved with many encouraging comments – see the Testimonials page. We are the leading company in the manufacture and distribution of anti chafe pads for yachts – with over 11,000 having been sold so far – the original and the best. Accept no imitations! For Product Information and to order – click on WEARANDTEAR PADS above. If you would like to place an order, please click on the appropriate yellow 'tab' above. Alternatively if you would like to act as a distributor or have any comments or queries, please use the form below.